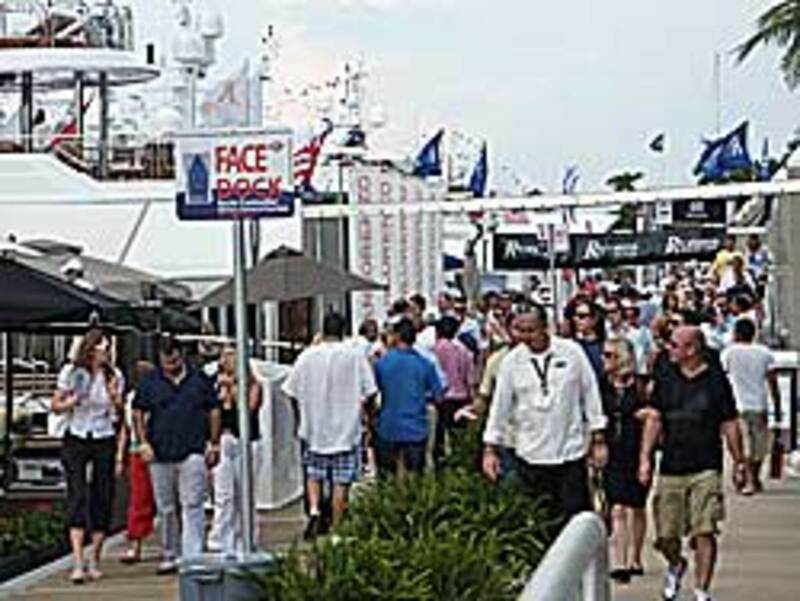 Attendance at this year&apos;s Fort Lauderdale International Boat Show, which concluded Monday, ran about 5 to 6 percent ahead of last year, show organizers told Soundings Trade Only. Additionally, exhibitors reported strong interest from the crowds, with many touting large increases in the number of boats sold at the show, compared with the past few years. "The attendance was up strongly the first three days of the show - Thursday, Friday, Saturday - Saturday itself was up about 23 percent, Thursday and Friday were up less," said Efrem "Skip" Zimbalist III, president and CEO of Show Management. "Sunday was down quite a bit because of the rain, and Monday was down a little bit. But overall we ended up 5 to 6 percent on attendance." Show Management does not release specific attendance figures. Zimbalist said he heard good reports from exhibitors, many of whom called it the best show in at least three years. There were 1,087 exhibitors this year - up from 2009. "We thought we had a shot from the exhibitor side of things to be flat with last year and we ended up, I think, up 5 percent in numbers and in dollars from last year, which was terrific, especially given the fact that we didn&apos;t have Pier 66 this year. But we did have the Sails property where Cakewalk [the U.S.-built, 281-foot yacht] was, so that kind of compensated for Pier 66," he said. For the first time, the show sent invitations to every registered boat owner in the country with a boat 35 feet or larger. Zimbalist said he thinks that helped get some people out to the event. Also, he noted, people seemed more optimistic than last year and ready to "pull the trigger" and purchase a boat. Many exhibitors who spoke with Soundings Trade Only said they, too, saw a more upbeat consumer walking around the show. "They were definitely in a more positive mood about shopping for new models and new boats," said David Hensel, brand and marketing director for Grand Banks Yachts. "They were lining up at the show - literally - to get on board our boats. Last year on Thursday when the gates opened, people started to trickle down the docks, and it was slow. "This Thursday [before the show officially opened] someone was at our booth asking to get on board the 53 and every time I went on the boat during the show it was packed with people," he said, adding that Grand Banks sold a boat at the show and came away with deals in the works and strong leads. "Overall, the mood was far better than it had been for many years and our hot lead list is extensive," said Bentley Collins, vice president, sales and marketing for Sabre and Black Cove Yachts. "Every model from the Black Cove 30 to the Sabre 52 salon express created plenty of good leads." Everglades, which was in the convention center, retailed about $2 million in boats, the company said. "We sold a lot of big boats, but we also sold boats across the line," said Bryan Harris, vice president of sales and marketing. "We sold 23s, 24s, 27s, 32s and 35s, so it was pretty well rounded for us across the board." Harris said the results from the show made him feel confident heading into 2011. "I think that people were waiting for the election to see what was going to happen, and so hopefully now that that&apos;s over and with Fort Lauderdale being a success, I think that will help our industry move forward," he said. Looking ahead to the 2011 Fort Lauderdale show, Zimbalist said he&apos;s feeling more optimistic than last year at this time. "Based on everything I know now, I [will] plan up a little bit, not dramatic, not huge, but up a little bit. I think people are encouraged by what happened this year, so I think the existing exhibitors will at least maintain the space they have and many of them will increase a little bit," he said. See the December issue of Soundings Trade Only for a full report from the Fort Lauderdale International Boat Show.